You'll visit kid-friendly attractions like Sea World Theme Park and Warner Bros. Movie World. Explore the numerous day-trip ideas around Surfers Paradise: Currumbin Wildlife Sanctuary (in Currumbin), Coolangatta Beach (in Coolangatta) and Dreamworld (in Coomera). Next up on the itinerary: kick back and relax at Surfer's Paradise Beach, tour the pleasant surroundings at Kurrawa Beach, have some family-friendly fun at Timezone Surfers Paradise, and identify plant and animal life at David Fleay Wildlife Park. For reviews, ratings, photos, and more tourist information, refer to the Surfers Paradise trip itinerary maker. London, UK to Surfers Paradise is an approximately 30-hour flight. 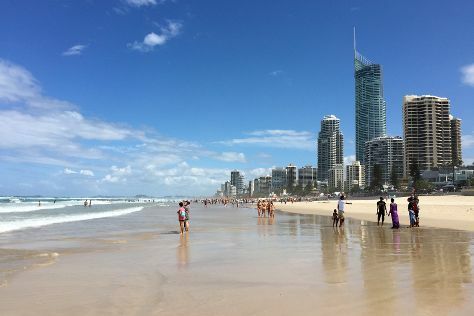 Traveling from London to Surfers Paradise, you'll lose 10 hours due to the time zone difference. Traveling from London in August, you can expect nighttime temperatures to be a bit cooler in Surfers Paradise, with lows of 11°C. Finish up your sightseeing early on the 25th (Fri) so you can travel back home.